In physics, an elementary particle or fundamental particle is a particle that might not be made of other particles. An elementary particle can be a fermion or a boson. Fermions are the building blocks of matter and have mass, while bosons behave as force carriers for fermion interactions and some of them have no mass. 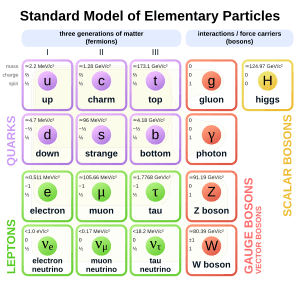 The Standard Model is the most accepted way to explain how particles behave, and the forces that affect them. According to this model, the elementary particles are further grouped into quarks, leptons, and gauge bosons, with the Higgs boson having a special status. Of the particles that make up an atom, only the electron is an elementary particle. Protons and neutrons are made of quarks. Quarks: up, down, strange, charm, bottom, top. Quarks come in three pairs, called "generations". One member of each pair has a charge of ⅔. The other member has charge -⅓.
Leptons: electron, muon, tau, electron neutrino, mu neutrino, tau neutrino. The neutrinos have charge 0, hence the neutr- prefix. The other leptons have charge -1. Each neutrino is named after its corresponding original lepton: the electron, muon, and tauon. 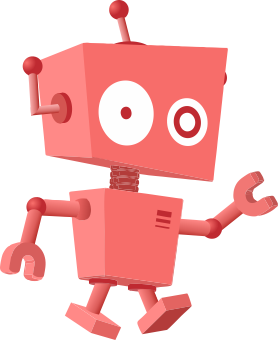 Elementary particle Facts for Kids. Kiddle Encyclopedia.